Latest News Coverage of Bansal Sales Corporation Pvt. Ltd.
LG Hausys announced the launch of the new 2014 HI-MACS® colors that will make architects and designer’s work easier. Andromeda, Carina, New Moon and Hercules, with an elegant and quartz-like appearance, while maintaining the universal advantages of HI-MACS® Solid Surface: easy to repair, invisible joints and thermoformability. The Solid colours have been enhanced as well with a new special shade: Midnight Grey, chosen by the renowned architect Jean Nouvel for its project at Hotel Puerta América in Madrid – Spain – Midnight Grey has now become part of the standard HI-MACS® colour range for 2014. 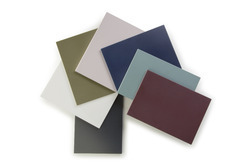 While HI-MACS® has been proving its worth indoors for many years, it can also be used for outdoor applications, especially for facades, therefore LG Hausys has recently recommended 12 colours for external applications, including Opal from the lucent range, allowing architects to create dramatic light effects for exterior wall cladding. The result is a full palette of 100 colours: Solids, Granite, Sand, Pearl & Quartz, Volcanics, Lucent, Galaxy, Marmo, and the eco-friendly recycled range of colours HI-MACS® Eden, which has up to 41% of recycled material thus helping your projects achieve LEED® credits in sustainable design.